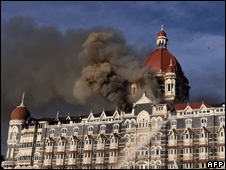 India’s foreign minister has said there is “a pause” in the peace process with Pakistan following the Mumbai attacks. However, Pranab Mukherjee, speaking in Indian-administered Kashmir, insisted the attacks were not a “Kashmir issue” and hoped “normalcy” would return. Earlier Defence Minister AK Antony said India was not planning any military action against Pakistan in response to the Mumbai. Last month’s attacks in the Indian city left more than 170 people dead. India says militants involved in the attack had Pakistani links. Pakistan denies any involvement but has promised to co-operate with the Indian investigation. It has been under tremendous Indian and American pressure to act. You are currently browsing the archives for the peace talks category.